Melencolia I was completed in 1514 A.D. by Albrecht Dürer. Of all the works he created, Melencolia I is a controversial allegorical work. Though it was created during Albrecht Dürer’s Nuremberg period when he served the emperor Maximilian, Melencolia I was not commissioned. In the right foreground, a winged figure sits with his head propped on one hand. In the other hand, he holds a compass tool. Other mathematical tools and shapes lay scattered about and placed on the structure behind the main figure. Chief among these is a magic square that sums to 34 and contains the date 1514 on its bottom row. Behind the main figure is a smaller cherub, also looking down cast. In the background a rainbow arches over a bright beacon beside a banner labeled “Melencolia I”. One of the most famous elements of this painting is the irregular rhombohedron that dominates the mid-ground of the painting. This object is referred to as Dürer’s Solid. The work is an engraved transfer print measuring 9.4 inches by 7.4 inches. To create the illustration, the artist etched the design in negative onto a copper plate and then inked the plate and transferred it onto paper with ink. Dürer is considered one of the greatest of the Old Master print artist of all time. His work revolutionized the art form and inspired generations of artists who followed him. 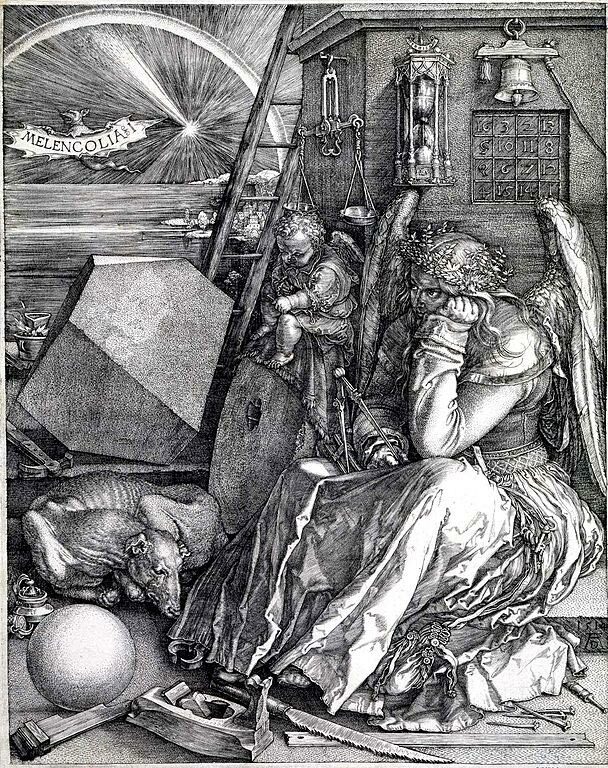 Dürer, as well as being an artist, was a mathematician and theoretical philosopher. All of his works contain multiple layers of symbology, and Melencolia I is especially rich in its symbolic language. One interpretation is that it represents the depressive state of the artistic temperament. Because many of the symbols in the painting that also appear in alchemical symbology, many people speculate that the painting is an alchemical allegory. One of three works considered to be Albrecht Dürer’s Master Prints, or “Meisterstiche,” along with his Knight, Death and the Devil and Saint Jerome in his Study, Melencolia I is Dürer’s most enigmatic and studied work. The angel is wearing a beautiful example of a 16th century caped dress.